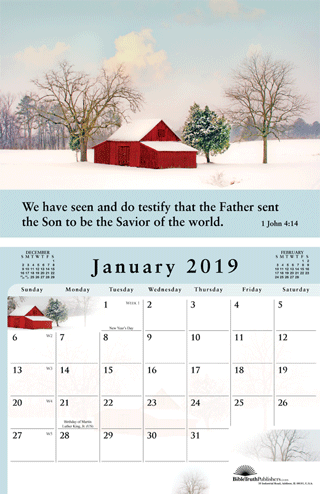 NOTICE: Due to higher than anticipated demand this year, we are sorry to announce that we have already used all of the custom calendar blanks for the 2019 Gospel of Peace Calendar, item #8101. However, we do have some high quality seconds still available. The large majority of these have only the occasional small flaw. We offer them to you at an additional 20% discount from the price shown on our website. This discount will not show up in your shopping cart but will be reflected when your credit card or account is charged. Satisfaction Guaranteed: If you should receive any calendars that have flaws that are unacceptable to you, we will refund your money for them. This beautiful, high-quality appointment calendar could add to your home, reach out to lost neighbors or encourage fellow-believers! Below on this webpage you can quickly create a calender to suit your needs, including a personal message and address on the bottom of each calendar page. Or using the tool to the right you can personalize far more options. Either one yields a beautiful calendar. Either personalization is free. Allow us 2‑3 weeks to produce your calendar to be safe. Instead of the express personalization to the left, you can take control over hundreds of other parts of your calendar at no extra charge. Add to your gospel message for neighbors, tailor one with local events for a community outreach or create a calendar just right to encourage your group of Christian friends or family. Add messages to every day of the year. Use different imprints for different months. Try it now risk free. You don’t order until you add to your shopping cart.